Musical Recommendations: There’s a great American little avant rock combo “District 97” - young people great ideas. The other is Vangelis - Greek composer - known to many - but obscured to some. His synth music is both unique and yet simple. Mythodea is my favourite album of his. It’s been a soundtrack to my life many times. 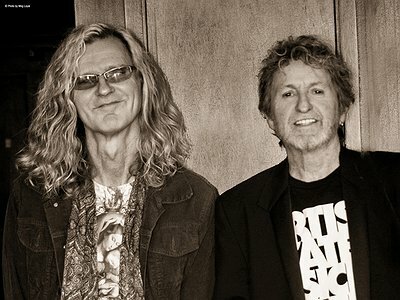 Contact/Website: If you enjoyed this interview with Roine Stolt, visit his profile page on the site of Inside/Out Music. I think I wrote my first piece of music when I was 14. I was influenced by the cool bands at the time - The Allman Brothers, Procol Harum, Rare Bird, The Jimi Hendrix Experience. I think receiving influences from others, in one form or another, is a lifelong process. Influences change over time and hopefully after some years in this business one will boost self-esteem and get to write music more or less from original ideas. But again, outer influences are a lifelong journey, for anyone who loves music. Today I get influenced more and more by classical music, jazz and world music - but occasionally bands like Coldplay,U2 or Muse do influence my later writings too. In the beginning I couldn’t really see the whole picture, it was more down to finding a cool guitar riff or line. I have learnt to see the whole picture and the structure of a full arrangement over years. My ears are sharper for details. When I started at 17, I was in a band and we were signed to DECCA so we had the best studios in Sweden at the time. Then, in 1979, I bought my first own multi-track. It was a TEAC 8 channel, from there a 16 track after a couple of years, both reel to reel. Then came the ADAT generation and in 1996 I switched to computer based recording and the MAC Logic platform. Now I have the latest, biggest, baddest MAC with Universal Audio plugin stations. Computer based recording is a blessing and a curse. For the latest production I did with Jon Anderson I sometimes had almost 40 tracks of vocals - some of them Jon’s - some mine - and some the choir guys/girls . Then there was all the drums, percussion, guitars, grand pianos and organs and all sorts of synths, plug ins and analogue gear … Just insane. Luckily I am a person that gets a natural high from just working with music, so I trust every working day in the studio will be creative - and it is. Working with Jon has been very rewarding, since he is as insanely dedicated as I am. See above - as far as instruments. I have everything really, besides my park of guitars that includes, rare Gibson Les Paul from 1953 , Gibson ES175 from the 60’s, Fender Telecasters, Stratocaster, Parker Fly, Fender Precision and Rickenbacker basses, 6&12 string guitars, Portuguese guitar, Lap Steel etc ... I also own a Hammond Organ, Mini Moog, Mellotron 400, Fender Rhodes etc. 2 drum kits and assorted percussion. So between all these and the modern software plug ins I can create just about any sound from tribal drums to a symphony orchestra and avant garde electronica. I rarely let the tools dictate where my music is going. I rather “hear” the music in my head and then search the right tool to illustrate what I’m hearing. Maybe I’m old fashioned - but that’s my way of thinking/working. Usually hear a melody or a riff of sorts in my head and then grab an instrument to get the basic idea down - then build from there. Sometimes that very piece of music need to ferment, lying around for weeks or months. Then I re-connect and finish it. I couldn’t tell really. I just do what I do and try keep an open mind. I do create a lot of music, however some of it is not suited for commercial release. I have a bigger symphonic work that I started 10 years ago, but it has no commercial value or potential so it is just sitting there. Well In a way I am improvising when I get to certain sections of a song - thinking "where could this idea go" - and I just fiddle around on the keyboard … see where it goes. Music and visions do indeed go well together. Film music is evidence of this. I’m interested in that and was indeed into trying to write film music, but now it’s late. I rather have graphics and light complementing my/our music. That’s what Jon & I hope to do with “Invention of Knowledge”: a multimedia show. Again, I do not make plans, no much really. I follow my heart at any given time - spontaneously - as I go along, I suppose. I’m a spectator, as much as anyone else. As a musician, artist - all you can do is to lay out the presentation of your latest work, then hope someone will connect. If they do, they will most likely have a thousand different reasons for liking or disliking what you do. They will interpret the music and the visions in a thousand different ways - all of them equally important or interesting. Well, a PR blurb or even an article will just scratch the surface of what an artist is about. I rarely come across an interview or article that covers who or what I am, the whole picture. Still we need it to inform people of our latest work. Well, that was probably what Jon(Anderson) and myself are talking about, a multimedia presentation of this album “Invention of Knowledge”: A (more than) 3 D presentation of surround sound and surround graphics and projections in odd concert halls. A totally new concert experience. But yes, it might be expensive. We’ll find out. But it has been my dream- and obviously his too. Here we are hoping to realize it in 2017. "Computer based recording is a blessing and a curse."